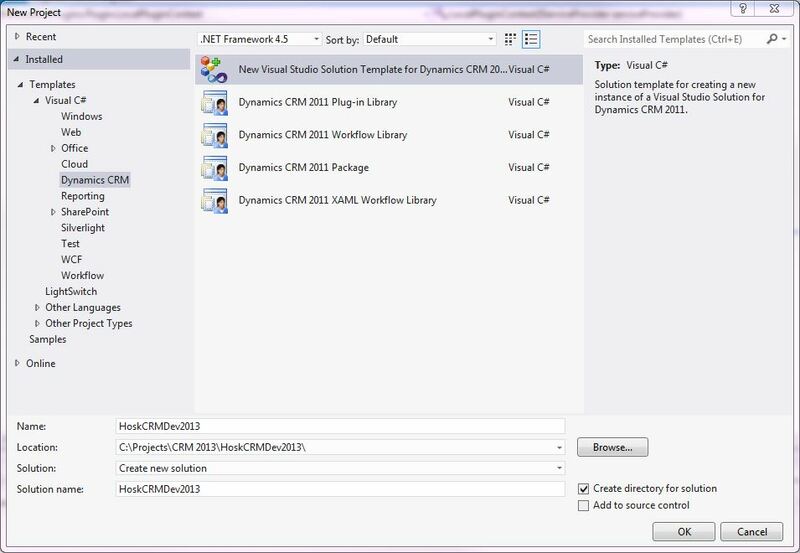 I would recommend looking at the CRM 2013 SDK because it is very useful and documents what all the options available. The reason I made this blog post and Hosk’s CRM Dev YouTube channel is The CRM 2013 SDK is a great resource but can be a little bit difficult to get started with but hopefully with the blog post and the video I will make it easier for you. This video will a bit of plugin theory (the blog will just contain the steps to create and deploy the plugin) and I will try and explain what we are doing and practical because I will go through the process of creating and deploying the plugin, step by step. This is a default file created by the CRM 2013 Development Toolkit. When you create a plugin, it will extend the Plugin class and use it as a base. The Plugin class uses the IPlugin interface and has the important Execute methods which all CRM plugins must have and this is the main method called. Make sure you connected to the correct CRM organisation and you have specified the correct Solution, so when you deploy your plugin it will be included in the correct solution. The Create plugin screen will be displayed. Project The plug-in library project in your Visual Studio solution. Class A recommended class name based on the selected pipeline stage and message. Primary Entity The entity that must be processed by the execution pipeline for the plug-in to execute. Secondary Entity Some messages require a secondary entity. See the documentation on the specific message for more information. Message The message that must be processed by the Microsoft Dynamics CRM execution pipeline for the plug-in to execute. Filtering Attributes A list of entity attributes that cause the plug-in to execute when it is changed. A value of null causes the plug-in to execute if any of the attributes change. When you specify a message that supports filtering attributes, for example Update, an ellipsis (…) button is displayed that lets you select attributes from a list. Run in Context Specify the system account that owns any data changes the plug-in makes. The Calling User is the logged on user who initiated the message to be processed. For more information, see Impersonation in Plug-Ins. Execution Order Specifies the order, also known as rank, that plug-ins are executed in a pipeline stage. Plug-ins registered by using an order value of 1 are executed first, followed by plug-ins registered by using an order of 2, and so on. However, if there is more than one plug-in in a stage with the same order value, the plug-in with the earliest compilation date is called first. Pipeline Stage Specifies when you want the plug-in to execute: before (Pre) or after (Post) the core operation that processes the message. For more information, seeEvent Execution Pipeline. Deployment Specify where you want the plug-in deployed: on the server, on Microsoft Dynamics CRM for Outlook with Offline Access, or both. Execution Mode For plug-ins registered to execute in a post stage, specify if you want them to execute immediately (synchronous) or queued to execute later (asynchronous). For post operations, specifying asynchronous execution gives you improved system performance compared to synchronous execution. Description A description of the step. Typically, you can describe the purpose of the step for other developers or administrators who might run the registration tool at a later date. Unsecure Configuration If you have written a constructor for the plug-in that takes one or two string arguments, any string values that you specify in these fields are passed to the plug-in constructor at run-time. For more information, see Write a Plug-In. Pre Image Alias A pre-image is a snapshot of the entity’s attributes before the core operation. The entity alias value that you specify is used by your plug-in code as the key into the image collection. Parameters The list of attributes to be include in the pre-image. Post Image Alias A post-image is a snapshot of the entity’s attribute after the core operation. The entity alias value that you specify is used by your plug-in code as the key into the image collection. Parameters The list of attributes to be include in the post-image. After you have finished selecting the choices for the plugin and press the OK button, a new file called PreAccountUpdate.cs will be created in the Plugin project. This will extend the Plugin class (a class created by the CRM 2013 Development Toolkit) and there will be a section for you to put in the code you want to execute in the plugin. The Development Toolkit will also update the RegisterFile.crmregister adding a new line for the account plugin you have added. Warning if you have this file checked into source control it might not editable and you will get an error because the Development Toolkit will try to update the RegisterFile.crmregister but won’t be able to because it’s read only. You will notice the guid values in the RegisterFile.crmregister are all 0000, this because proper guid values will be created when you register the plugin in CRM, at the moment the plugin does not exist in CRM yet. Below is the RegisterFile with the plugin that has been deployed so the guids have values. I am creating a very simple plugin, all it does it update the Description field on the account form when the account update is triggered, which will be 30 seconds because this will be triggered by the CRM 2013 autosave feature. "HOSK CRM DEV FIRST PLUGIN HAS RUN AND UPDATED THE DESCRIPTION"
/// Initializes a new instance of the <see cref=”PreAccountUpdate”/> class. // Note : you can register for more events here if this plugin is not specific to an individual entity and message combination. // You may also need to update your RegisterFile.crmregister plug-in registration file to reflect any change. /// For improved performance, Microsoft Dynamics CRM caches plug-in instances. /// is stored in the context. This means that you should not use global variables in plug-ins. Now you have finished writing the code, it’s time to deploy the plugin in CRM. Your user will need to be a CRM Administrator. If you are deploying plugins which are not in sandbox Isolation mode then you will also need to be a Deployment Administator. As I am deploying to CRM 2013 online then the plugin has to be only a CRM Administrator because the plugin has to be in sandbox isolation mode. You will either get an error or it will have worked. Often when it has worked it will inform you the RegisterFile.crmregister file has changed, this is CRM 2013 Developer Toolkit updating the file with Guid’s for the plugins. You can also check by opening your Solution and looking in the plugin assembles section. I hope you subscribe to Hosk’s CRM Dev youtube channel where I will be going through the lots of different ares of CRM 2013 Development, this is useful for people who are starting out CRM Development, Developers who haven’t used CRM 2013 yet or just CRM Developers. I had to set an OptionSetValue in a plugin this week and for some reason I totally forgot how to do it, which kept causing my plugin to crash. Like all things in CRM, once you have done it you wonder what all the fuss was about and how simple it seems but before you have cracked it, it can be very frustrating. The other unusual thing I found was I couldn’t Google any examples, so I thought I would show an example on this blog so if I can’t do it in the future at least I would know where to look. I will briskly take you through the basics. OptionSetValue is a drop down list in CRM. The OptionSetValue is a list of int values linked with a metadata list of text values. I think it is done like this so you can store the OptionSets in a database and you have to split them up. The main thing which was confusing me is firstly OptionSetValue is a class and to then get the actual OptionSetValue you have to put you class name and then Value. For some reason I was then trying to set just the value, which is stupid when I think about it but it was late on a Friday and my brain had clearly stopped working for the week. Now you can see that one of the constructors takes an int32 value. Most of the time if you are creating an OptionSetValue which you want to write to a CRM object then you will pass in the int value of the optionset. This is a common Gotcha, people will often set this value to a value which isn’t in the OptionSet values in CRM. To find the values, you need to open the entity going through solutions (basically as if you are going to edit it) with the optionset you want the values for. So from the above you can see the int number you want to assign to the optionSetValue is 143570000.
the number below is the value. As I have said before one of the most common problems people will experience is they will try and set an OptionSetValue to an int number not in the list of dropdown values. Many a times you would have the need to transfer data from one Microsoft Dynamics CRMorganization to another for some record type. This blog covers the steps you can follow to move data from one organization to another using Import Wizard. Let us take example that you want to move data for Account and Contact record types. 1. Create a view of all fields for the record type Account. Click Edit Columns in the dialog that pops up and then click Add Columns. Click ‘ok’ and then Click ‘Save’ on the Ribbon in Advanced find dialog. It will prompt you for name of the view .Provide the name for the view. 2. Navigate to view (Account) and Export the data in Static Excel format. a) Go to Accounts Grid. b) Navigate to Accounts view. c) Click Export to Excel. d) Select “Static worksheet with records from all pages in current view”. e) Click Export and save the file. (Account.xls)(The records that are exported will be based on the record for which you had privileges). Note: Do not check make this data available for reimport checkbox as this feature is meant to export and update data in the same organization and not for cross organization data migration. 2: Similarly export the data for Contact record type and save as CSV/XMLSS file.(Contact.csv). 3: Zip the two files in a single Zip file (ExportedData.zip). Launch Import Wizard and Upload the zip file in Import Wizard. Select Default (Auto mapping) as shown in the screenshot below. At Map field page, fields whose name matches will automatically will be mapped. Check the mappings and if there are fields which are not mapped then map those. If there are customizations (e.g. some custom fields) that you want to do you can do it from Import Wizard itself. You can create new field from Import Wizard and do the mappings. If you want to ignore all unmapped fields, click Next. All unmapped fields will be ignored. Finish the Import Wizard and Wait for Import jobs to finish. You can check their status in Imports grid. That is it you are done Importing data for these record types. // delay one second and try again. because the grid.htc (Html Component) actually includes a public event “onrefresh”… And this event can be handled with any function. We dont need to dive into the eventManager and scriptEvents. getIsDirty: (Applicable: All) Returns a Boolean value indicating if there are unsaved changes to the attribute value. 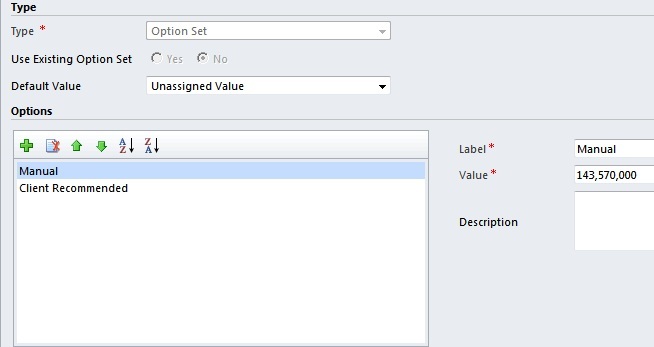 getSelectedOption: (Applicable: optionset) Returns the option selected in an optionset attribute. setValue: (Applicable: All) Sets the data value for an attribute. getName: (All) Returns the name assigned to the control. getParent: (All) Returns a reference to the section object that contains the control. getSrc: (IFrame, Web Resource) Returns the current URL being displayed in an IFRAME. setData: (Silverlight Web resources) Sets the data query string parameter passed to a Silverlight Web resource. setDisabled: (All except Web Resources) Sets a value indicating whether the control is disabled. setFocus: (All) Sets the focus on the control. setLabel: (All) Sets the label for the control. setSrc: (IFrame and Web Resource) Sets the URL to be displayed in an IFrame. getLength: Returns the number of controls in the collection. getLength: Returns the number of navigation items in the collection. getCurrentItem: (Method) Returns the form currently being shown. forEach: Applies the action contained within a delegate function. getLength: Returns the number of roleForms in the collection. getLength: Returns the number of tabs in the collection. getLength: Returns the number of items in the collection.